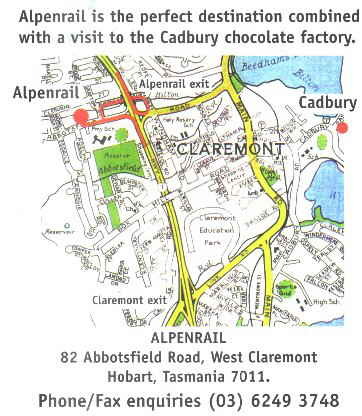 We are conveniently located just off Route 1 (Brooker Highway) - in the City of Glenorchy on the northern outskirts of greater Hobart at Claremont - not far from the well known Cadbury Chocolate Factory. If coming from the south of Hobart on Route 1, do not take the Claremont exit ramp, but continue for a few hundred metres to the “Abbotsfield Rd” / “Alpenrail” exit. Our premises are located just up the road from the exit, right opposite Abbotsfield Primary School. If coming from the north on Route 1, take the “Abbotsfield Rd”/ “Alpenrail” exit located a few hundred metres after the “Austins Ferry” exit. Then just follow the Alpenrail signs which will lead you under the highway in a circular fashion to our establishment. For those customers in the Claremont / Cadbury area, we suggest you follow the smaller signs mounted on the Street name sign posts.